This webpage provides data for the Changing Land-Atmosphere Feedbacks in Tropical African Wetlands research project. All variables listed below are described in Marthews et al. (in prep.) below. All files were generated using Esri ArcGIS 10.0 (the GeoTIFFs) and FORTRAN 90 code (the NetCDFs) at 15 arc-sec resolution (cells ~ 463 m x 463 m at the Equator) snapped to the HydroSHEDS Digital Elevation Model (Lehner, B., et al. 2008) and are free to download (you may need 7-zip to unzip them). The data can be resampled to lower resolution in a GIS package, if required. These GIS layers have been derived in collaboration with and with the agreement of Prof. Bernhard Lehner at McGill University, Canada. It is a condition of using these data that our paper in HESS be cited (Marthews et al. 2015, link) and, if any further papers result from extensive use of these data grids, both Simon Dadson and Toby Marthews be invited as co-authors (please email Toby for more information). The African Wetlands project data, including topographic index calculations, is password protected. If you would like access please contact Dr Toby Marthews. 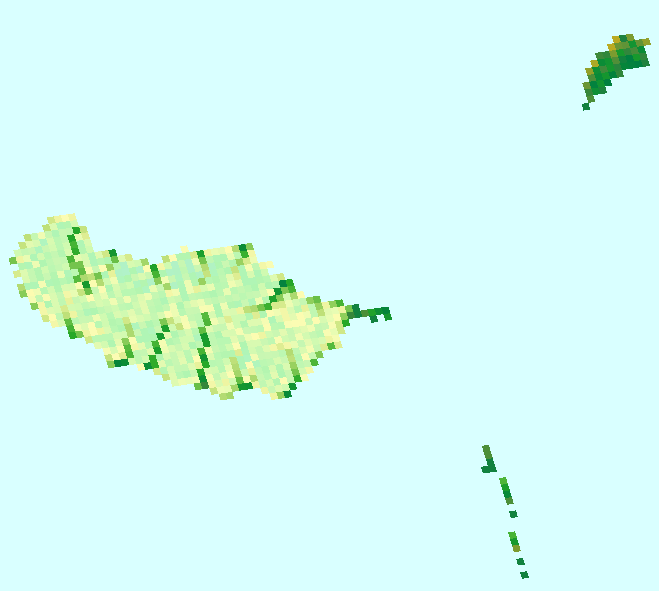 Variable topidx (dimensionless) in GeoTIFF [29KB ZIP] or NetCDF [23KB ZIP] format. Variable topidx (dimensionless) in GeoTIFF [3.5GB ZIP] or NetCDF [1.89GB ZIP, version corrected 20-FEB-15] format (both 15 arc-sec resolution). For convenience, here we also provide a 0.5° version of the same data in NetCDF [0.5MB ZIP] snapped to the standard WATCH grid. This version was aggregated to 0.5° by Dr Charles George at CEH Wallingford in March 2014 (please note that CEH does not accept any liability for the use of this data layer). All NetCDF files conform to the Climate and Forecast (CF) conventions and are intended for use as topographic ancillary files for the TOPMODEL routing model option within the JULES land surface model (see here). The topidx variable here is directly comparable to the compound topographic index available from USGS's Hydro1K at 30 sec resolution (e.g. 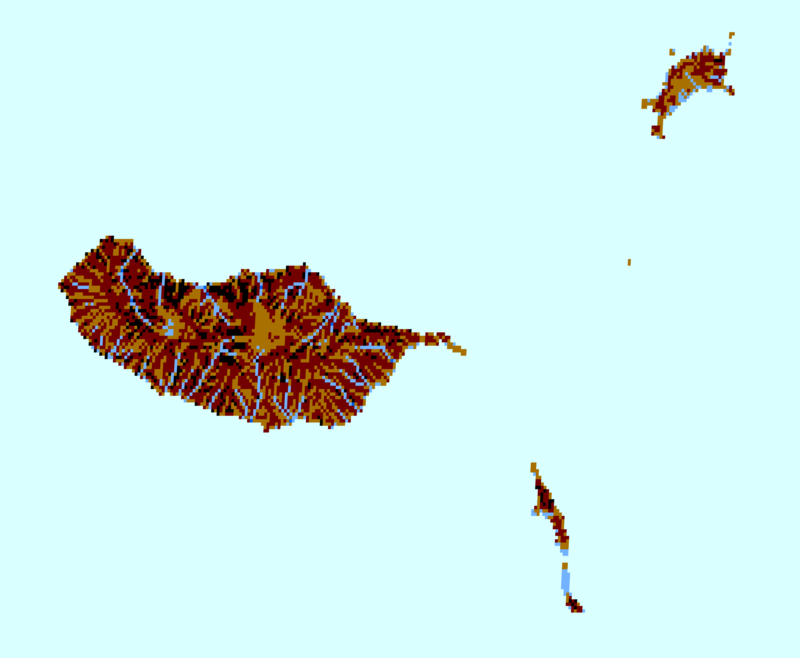 Madeira, left). 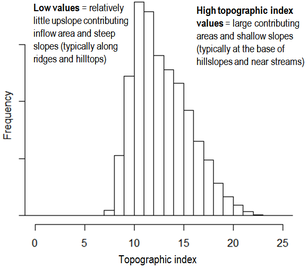 Values >=0 are valid topographic index values, -99999 indicates ocean and -1 indicates lakes, reservoirs, glaciers and ice sheets. Antarctica, the Azores and several oceanic islands are excluded from these layers because they were excluded from the HydroSHEDS DEM.